What would happen if the most powerful technology company in the world and the largest clandestine spying agency in the world joined forces? No need to wonder. Just look around you. It’s happened already. Thanks to an insidious partnership between Google and the National Security Agency (NSA) that grows more invasive and more subtle with every passing day, “we the people” have become little more than data consumer commodities to be bought, sold and paid for over and over again. With every smartphone we buy, every GPS device we install, every Twitter, Facebook, and Google account we open, every frequent buyer card we use for purchases—whether at the grocer’s, the yogurt shop, the airlines or the department store, and every credit and debit card we use to pay for our transactions, we’re helping Corporate America build a dossier for its government counterparts on who we know, what we think, how we spend our money, and how we spend our time. What’s worse, this for-profit surveillance scheme, far larger than anything the NSA could capture just by tapping into our phone calls, is made possible by our consumer dollars and our cooperation. All those disclaimers you scroll though without reading them, the ones written in minute font, only to quickly click on the “Agree” button at the end so you can get to the next step—downloading software, opening up a social media account, adding a new app to your phone or computer: those signify your written consent to having your activities monitored, recorded and shared. It’s not just the surveillance you consent to that’s being shared with the government, however. It’s the very technology you happily and unquestioningly use which is being hardwired to give the government easy access to your activities. In this way, Congress can pass all the legislation it wants—it will have no real effect on the NSA’s activities—because the NSA no longer needs to dirty its hands by spying on Americans’ phone, email and internet activities, and the government can absolve itself of any direct wrongdoing. They can go straight to the source, as evidenced by a Freedom of Information Act request detailing the close relationship between Google higher-ups Eric Schmidt and Sergey Brin and NSA Director Gen. Keith Alexander. 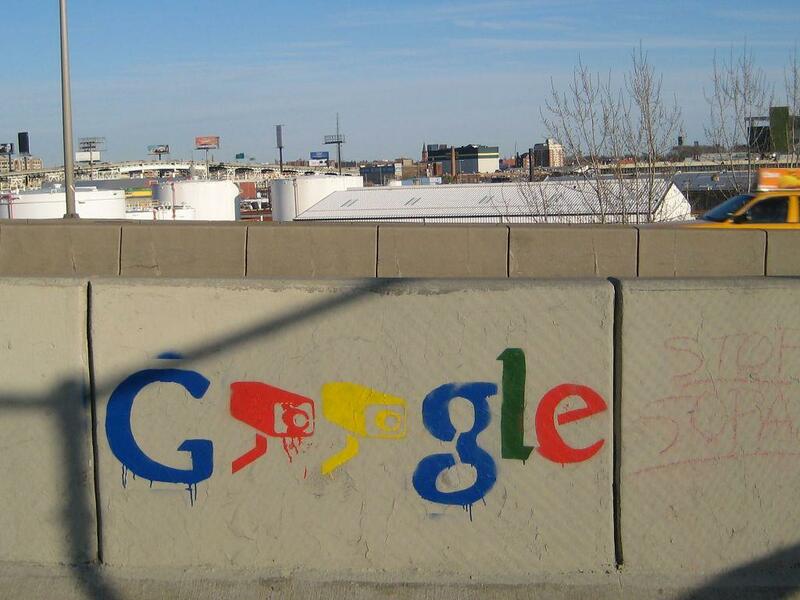 With Google in its hip pocket, the NSA can just bypass any legislative restrictions dreamed up to appease the electorate and buy their way into a surveillance state. While one billion people use Google every day, none of them pay to utilize Google’s services. However, there’s a good reason that Google doesn’t charge for its services, and it has nothing to do with magnanimity, generosity, altruism, or munificence. If as the old adage warns, there’s no such thing as a free lunch, then what does Google get out of the relationship? Simple: Google gets us. Oh, how right he was. Soylent Green is indeed people, or in our case, Soylent Green is our own personal data, repossessed, repackaged and used by corporations and the government to entrap us. In this way, we’re being bred like cattle but not for food—rather, we’re being bred for our data. That’s the secret to Corporate America’s success. Google, for example, has long enjoyed a relationship with clandestine agencies such as the CIA and NSA, which use Google’s search-technology for scanning and sharing various intelligence. The technology leviathan turns a profit by processing, trading, and marketing products based upon our personal information, including our relationships, daily activities, personal beliefs, and personalities. Thus, behind the pleasant glow of the computer screen lies a leviathan menace, an intricate system of data collection which transforms all Americans into a string of data, to be added, manipulated, or deleted based upon the whims of those in control. Take, for example, Google’s Street View program, which gives a fully immersive street level view of towns across the world. The program was constructed by Google Street View cars outfitted with 360 degree cameras, which seemed a neat idea to many people, most of whom didn’t realize that the cars were not only taking pictures of all residential and commercial districts which they drove through, but were also “siphoning loads of personally identifiable data from people’s Wi-Fi connections all across the world,” including emails, medical records, and any other electronic documents that were not encrypted. What Google’s vast acquisition and analysis of information indicates is that we are entering what some have called an age of infopolitics, in which the human person is broken down into data sets to be collated and analyzed, and used for a variety of purposes, including marketing, propaganda, and the squelching of dissent. As philosopher Colin Koopman notes, we may soon find ourselves in a more efficient version of the McCarthy era, in which one’s personal beliefs or associations become fodder for the rising corporate surveillance state. Toward this end, Google has been working towards what one investor called “a Manhattan project of AI [artificial intelligence].” For those who remember their history, the Manhattan Project was a top-secret, multi-agency, multi-billion-dollar, military-driven government project aimed at building the first atom bombs. This project not only spawned the nuclear bombs used at Hiroshima and Nagasaki, but it also ushered in a nuclear arms race that, to this day, puts humanity on the brink of annihilation. No less powerful and potentially destructive to the human race are modern-day surveillance and robotic technologies, manufactured by corporations working in tandem with government agencies. These are the building blocks of the global electronic concentration camp encircling us all, and Google, in conjunction with the NSA, has set itself up as a formidable warden. The question, when all is said and done, is where will all this technology take us? It’s a conundrum I explore at length in my book A Government of Wolves: The Emerging American Police State, which looks to film, fiction and art as indicators of the police state that now surrounds us, brought about with the help of the government and its corporate partners. It won’t be long before we find ourselves, much like Edward G. Robinson’s character in Soylent Green, looking back on the past with longing, back to an age where we could speak to whom we wanted, buy what we wanted, think what we wanted without those thoughts, words and activities being tracked, processed and stored by corporate giants such as Google, sold to government agencies such as the NSA and CIA, and used against us by militarized police with their army of futuristic technologies. Judge, Jury, and Executioner: Have the Police Become a Law Unto Themselves?